This page is a hand-picked collection of topics that are focused on women in business and female entrepreneurs. Books written today on women’s issues often cite, and accurately so, how women are misunderstood and undervalued in the world of business. These books often point out how men are either blind to these inequities or intentionally instigate them. What many of these works miss, though, are the misunderstandings that women have of men. From a balanced perspective, to misconstrue is a human condition, not the domain of any one gender. The myths that men and women have of each other are often based on generalized characteristics or expected behaviours. Such stereotyping tends to be self-perpetuating: Men and women will seek confirmation of their beliefs through any behaviour exhibited by the other side, while each gender may not realize that their very conduct may perpetuate the assumptions made about them. Women are not serious about business: Women leaving organizations will often cite their reasons as “personal” so as not to burn bridges. Men believe they are hearing the truth, which perpetuates the myth that women’s personal issues will usually override their seriousness about business. Women validate this myth by not revealing the truth as to why they are leaving. We recently interviewed 2,400 women who left their positions in various Fortune 500 companies and discovered five key reasons for their departure: not being valued; feeling excluded; male-dominated work environment; lack of opportunity; and work-life issues. Women can’t hack it in business: Men will point to the one or two women in executive positions in their company as proof that, even though 50 per cent of their graduating class were women or more than half of their middle management is now made up of women, only a few are competitive enough to make it to the top. Women again perpetuate this myth by not disclosing their actual reasons for quitting. In a 2009 Harvard Business School survey on “the exodus of women,” 82 per cent expressed a desire to work with people they respect, 80 per cent wanted freedom to be themselves, 79 per cent sought flexible schedules, 64 per cent wanted recognition for their unique strengths and 15 per cent desired a more powerful executive position. Only 6 per cent said they quit because the work was too demanding. Women lack self-confidence: When women openly express doubt, men interpret this as a lack of self-confidence or an aversion to making tough decisions. It’s human nature to harbour feelings of uncertainty, but men suppress such emotions. Women, by their very nature, are more open and trusting and, as a result, regarded as the weaker gender. Men don’t listen: Women maintain that men don’t listen, so they’ll continue talking with the hope that men will eventually catch on. This, in turn, causes men to “tune out,” which then reinforces the assumption that men don’t listen. The reality is, men and women listen differently. We tested 220 statements of more than 100,000 men and women in 5,000 diagnostic sessions. Women interpreted the simple question “What do you think?” as a prelude to a conversation or an exploration of feelings; men interpreted it as being asked to give an opinion or make a decision. Men are exclusionary: Women will point to men’s club-like behaviour in meetings and at business socials and claim that their intention is to exclude. Men, confronted with this challenge, will recall all the times they were inclusive and respond with, “No, that’s not true. I really did want to include you.” They will discard such accusations because, in their recollection, their intent was never to exclude. Men’s behaviours are intentional: Women believe that men’s deliberate intention is to maintain an imbalance by not including them in meetings and on teams. The assumption is that, if men are behaving a certain way, then it must be their intention. Moreover, if they’re not reacting at all, it’s their intention as well. The fact is, men don’t give thought to situations at the level of detail that women do. Women are more inclusive and cultivating by nature, and the fact that men aren’t only serves to sustain the belief that men are intentionally non-inclusive and non-cultivating. Myths such as these are endemic in business because men and women don’t fully understand the reasons for the differences between them. “Gender intelligence” – the ability to comprehend the distinguishing characteristics of each gender beyond that of physical and cultural to include attitudinal and behavioural distinctiveness – is the best path to that understanding. It’s an informed and active consciousness that values difference-thinking in such areas as strategic thinking, team leadership and decision-making. Only when these gender myths are understood and resolved will men and women learn to fully appreciate the contributions intrinsic to each other and engage confidently and effectively in workplace settings. This article is an edited reprint of an article written by Barbara Annis, chair of the Women’s Leadership Board at Harvard’s Kennedy School of Government and CEO of Barbara Annis and Associates in New York. This infographic was sent to us by Junette Keefe of Successful Endeavours – thank you! If you would like to read more about Successful Women In Business, <— click on the hyperlink for a great article. In an August 2013 The Economist magazine article, a research study of 3,000 academic articles revealed that female academics are less likely to cite themselves in their own research than men, thereby reducing their citation index rankings that are vital in this publishing-centric profession. Now that this has been uncovered, let’s hope it starts to make a difference. As of October 2013, things are improving for Australian women in accounting, it’s a step in the right direction! 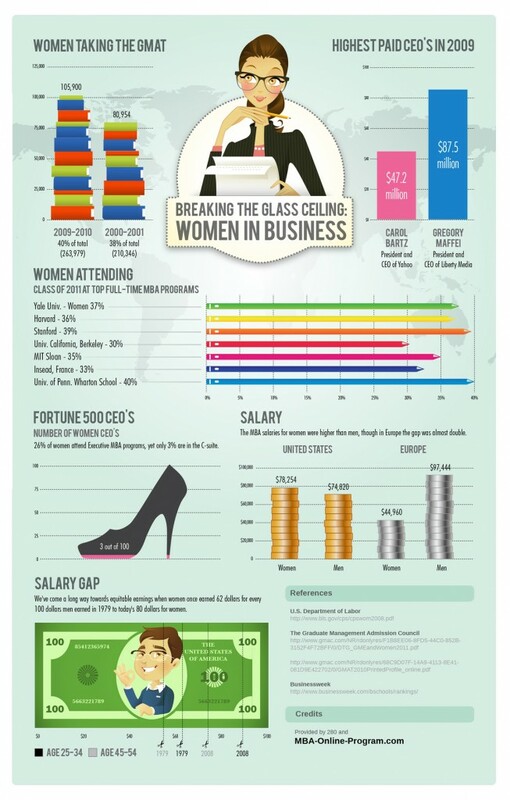 Is there a glass ceiling for women in 2013? Have a look at the infographic below and you decide! There is still a long way to go even though Harvard has apologised for how it has treated female students and professors. It is a first step on the road to equality that needs to be taken. What remains to be seen is how quickly those steps are taken. Time will tell! An overwhelming majority of female entrepreneurs received greater value from experienced mentors and former colleagues, according to the 2013 Westpac report. This suggests women are more confident in business when they have access to advice from like-minded individuals who can share their war stories and success strategies. In a recent community survey conducted by the Australian Businesswomen’s Network (ABN), 52 per cent of members said access to mentors and role models would contribute positively to their success. Groups, such as the ABN, can help entrepreneurs to increase their confidence by connecting small business owners from around the country and offering them advice on areas important to business success such as marketing, finance, networking and business education. — > Our elite Platinum Program boasts 40-55% female participants. Contact us if you want to network with top Australian Business Women who are at the top of their game. US statistics reveal that women-owned businesses currently have an economic impact of $US3 trillion and represent 23 million jobs in the US. If female entrepreneurs in the US started with the same capital as male entrepreneurs, they could add 6 million jobs to the US economy in five years. This gender intelligence is fascinating and thought provoking. I suspect every business could advantage from a healthy balance of both appropriate placement of the competitive and exclusive along with inclusive and cultivating. To keep silent about gender bias and gender myths will only limit our learning, understanding and interaction with 50% of people we meet. Wouldn’t it be great to encourage people to speak openly about gender myths so to widen our perspective and leverage the best from Mars and Venus. Taking this a step further to advantaging team working with people’s individuality, who’s willing to admit they may advantage from looking to learn more about behavioural distinctiveness to make the most of the people they work with. Is not male-female relationships perhaps one of the most excellent places to start a targeted discovery for which each being on one side has so much to gain to learn from? Gender gap has been at the forefront of economic development discussions, not just as an important factor on the human rights front, but in the interest of the global economy. Unconscious bias is particularly important as it arises from the implicit assumptions and unspoken attitudes, beliefs and expectations that we all have about others. Study after study has highlighted that both men and women have unconscious gender biases. Overcoming stereotypes and unconscious bias can only be achieved if we are all willing to address our own immediate judgments and can put in place practices and procedures to mitigate their potential effects. Gender equality help boost economic growth, as greater female labor force participation and educational attainment may lead to higher productivity and gross domestic product growth. Besides, it’s only in the state of mind of an individual. Women empowerment is the fostering of a woman’s sense of self-worth, her decision-making power, her access to opportunities and resources, her power and control over her own life inside and outside the home, and her ability to affect change. Maybe, that’s what women needs.